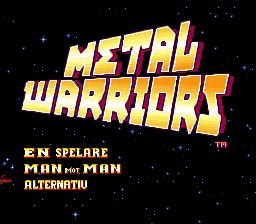 Metal Warriors is the spiritual sequel of Cybernator, developed by the Zombies Ate My Neighbors-Team of Lucas Arts and published by Konami. It fell into obscurity after the originally planned publisher Nintendo put it down. It only got released in the US in very limited quantities. 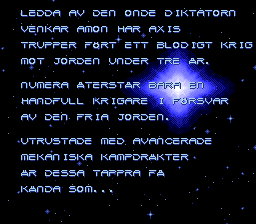 Anyway, this game is one of the finest in its genre. 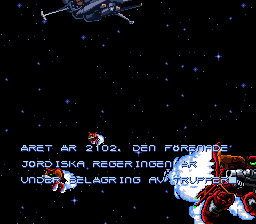 Well… in my opinion Cybernator is still the better game, but there is a lot of quality in Metal Warriors. 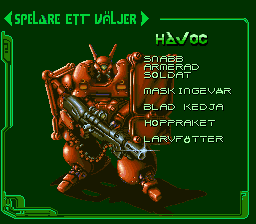 Surprisingly good cutscenes for a 16-bit console, very well-designed levels, which often require a tactical twist of the player to make it to the end and the possibility to change mechs during missions make this game worth your time. The missions dont seem very balanced, some of them are crazy hard and the next one might be inappropriately easy. But there is indeed also a lot of good variety in the missions. Also there is a 2 player battle mode which is good for some short fun, but lacking variety to make it fun for more than 15 minutes or so. It’s not a perfect game but its a very good one. If you didn’t know about Metal Warriors yet, you better check it out pronto! 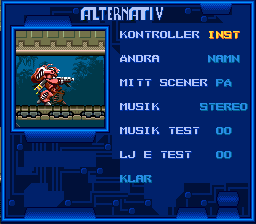 Everything except for the compressed stuff is translated, and that’s about 90%.